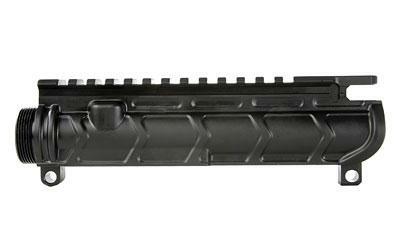 The Bootleg Upper Receiver is machined from forged 7075 aluminum and hard anodized per Mil-Spec. The lightweight design eliminated the forward assist to save weight The upper is .8oz lighter than a standard Mil-Spec upper receiver at 6.2oz stripped. When all of the hardware is installed is is 1.7oz lighter due to the eliminated forward assist. The captured dust cover door pin eliminates the need for the E clip. *Note*: Due to the additional material Old PWS, Odin works and Geissele handguards will not work with the additional material on the barrel extension interface.